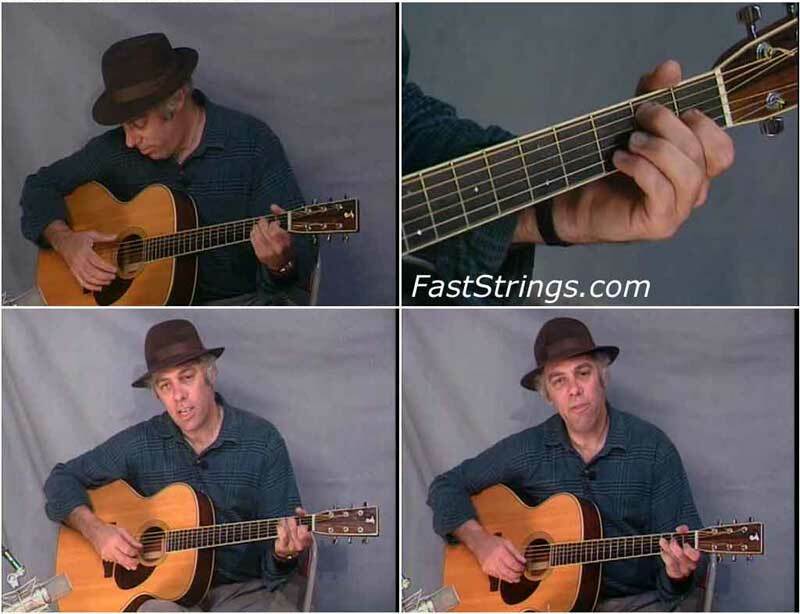 Fred Sokolow Beginner’s Blues Guitar. In this DVD lesson, Fred Sokolow starts at the very beginning: tuning up and playing simple chords. But by the end of this 70 minute session you will be playing the blues in several keys, strumming and fingerpicking. You’ll know how to play: Blues turnarounds Boogie Woogie bass lines Several strumming and fingerpicking accompaniment patterns Blues solos, licks and accompaniment styles of Lightnin’ Hopkins, Big Bill Broonzy, Jimmy Reed, Mississippi John Hurt and others Classic blues tunes like How Long Blues, Keys To The Highway, Baby What You Want Me To Do, Blues With a Feeling, Hesitation Blues. Easy to follow instructions which shows you, how to play your first blues tunes in several keys. From strumming versions to the quite nice fingerpicking. Everything is described in detail. Fred is great teacher and his quite simple aproach works very well.